September marks the start of narwhal migration season, but this fragile species is facing new challenges posed by global warming, commercial fishing, and seismic testing. Here Todd McLeish, author of Narhwals: Arctic Whales in a Melting World details some of the perilous new threats this endangered marine mammal faces in its annual move to warmer waters. Mid-September is the beginning of migration season for nearly the entire population of 80,000 narwhals that spend the summer in the bays and fjords of the High Arctic islands of eastern Canada and the west coast of Greenland. After spending the ice-free months of July, August, and early September traveling in large groups, raising their calves, and eating next to nothing, they are beginning their slow journey to the southern end of Baffin Bay. They will be forced south for several hundred miles, keeping ahead of the southward expansion of sea ice until November when they reach what will be the edge of the winter ice pack, which typically extends across the Davis Strait from southern Baffin Island to the central coast of Greenland. There they will repeatedly dive to the seafloor — nearly a mile below — to feed on abundant fish and squid. The 30-minute round trip feeding forays aren’t without risks, as they must not only find food but also an opening in the ice cover to breathe while avoiding Greenland sharks in the water column and waiting polar bears at the surface. But the greater threats they face lay not in the predators they have avoided for tens of thousands of years — including killer whales, their chief summertime predator — but in the increasing threats resulting from a warming climate. We read a great deal in the news about the declining summer ice that is likely to make the North Pole ice free in summer in just a few years, but little is written about the changing weather patterns that cause shifts in the ice, opening leads for marine mammals to surface to breath and quickly closing them again, sometimes entrapping whales and sending them to their death. September is a particularly risky month for ice entrapments, as the longer ice-free periods entice the whales to stay north longer than they should. Recent events are likely to add additional stresses to the population of narwhals and other marine mammals in the area. A newly approved plan by the Canadian government for seismic testing in Baffin Bay and the Davis Strait, which is currently being challenged in court by several Inuit communities, is likely to have a significant effect on narwhals. The animals are skittish and easily frightened by minor noises like splashing by Inuit kayakers, so the loud noises from seismic testing and future oil and gas drilling could force them to abandon their wintering and nursery grounds altogether. Similar problems are likely to arise as increased shipping occurs in the Arctic Ocean. Seventy-one cargo ships traveled a route north of Russia to get from the Pacific Ocean to the Atlantic in 2013, and those numbers are expected to increase dramatically in coming years. The first cruise ship will cross the Northwest Passage north of Canada and Alaska in 2016, opening the region to expanded travel and tourism that is unlikely to benefit whale populations. And longer ice-free periods each year are already expanding the commercial fishing season in Greenland, which is in direct competition with narwhals, who primarily feed upon the same species targeted by the fishermen, Greenland halibut and Arctic cod. Although it was just 18 months ago that Narwhals was first published, its predictions about the future threats the animals would face appear to be coming true sooner than expected. 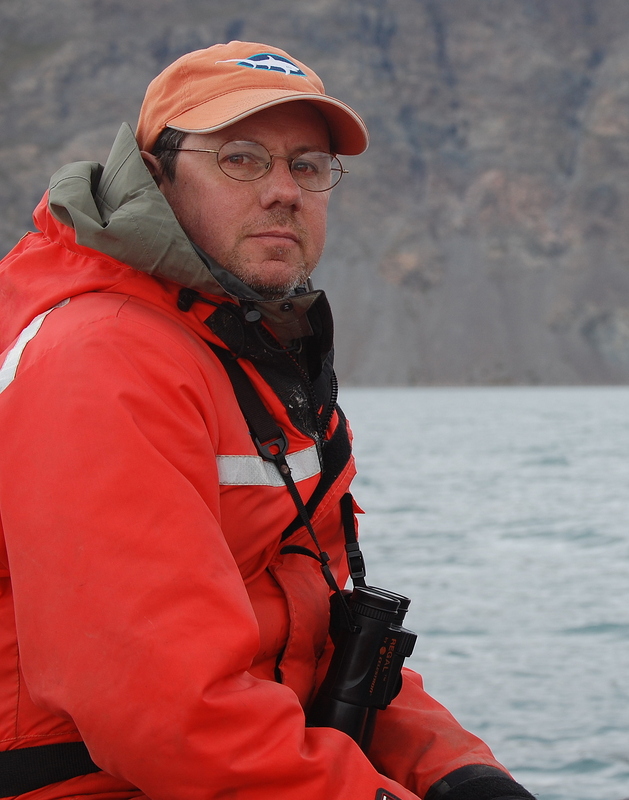 Todd McLeish is the author of Narwhals: Arctic Whales in a Melting World, which is newly available in paperback. His other publications included Golden Wings and Hairy Toes: Encounters with New England’s Most Imperiled Wildlife and Basking with Humpbacks: Tracking Threatened Marine Life in New England Waters. He lives in Pascoag, Rhode Island. This entry was posted in Current Events, Environmental History, Guest Post and tagged commercial fishing, Greenland on September 10, 2014 by uwpressblog. Todd McLeish has posted an article that highlights some of the threats to Narhwals that he discussed at length in his new book, Narhwals: Arctic Whales in a Melting World. Check out his post from University of Washington Press.